This post offers you the solution from the great Steve MO!!. Now for folks who do not know Steve MO, He is an MVP and Whiz who has answered more than 10,000 questions in the success community on reports. He had a session with our Philly Salesforce user group and I had the honor of listening to his session. Based on his session, I am sharing 2 reports which would be a great value-add for you to wow your users!! 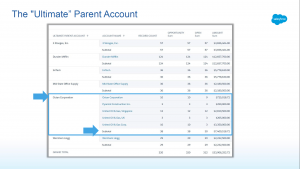 If you use parent account and account hierarchy like as an example Abc Account Global –> Abc Account NA, ABC Account Europe which is regional accounts, there is a problem with the current reports in Salesforce. We need to display the Opportunity Sales Pipeline of an entire Corporation that spans multiple Parent and Subsidiary Accounts across several tiers of Parent and Subsidiary Accounts. However, the Standard Parent Account Field only goes up 1 Level and returns the name of the Account 1 Level above that Account It also displays a blank value if there is no Parent of that Account. You can see the example of the standard salesforce functional report which is shown below. Create a custom Formula Field on the Account Object. 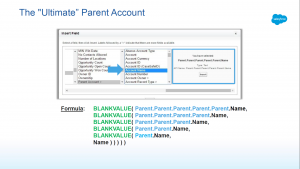 Create a formula field on account object called Parent Account of type text that will return the name of the Top Parent Account in the Account Hierarchy, no matter where in the Account Hierarchy the current Account is located (even if there is no Account Hierarchy). Parent Account of type text on your Account object. The below formula goes 6 levels deep and so feel free to customize it based on your account hierarchy levels. If you have seven levels, repeat it for 7 steps. BLANKVALUE( Parent.Name,Name))))) . Please click below to copy the formula field. This keeps checking the parent account from the current account and moves up the account hierarchy until it finds the parent account and displays the name of the parent account. If the account is the parent account, it would display blank value. Look at the below screenshot if you want to create the formula using point and click. Here is the screenshot of a final report and how it shows up once you use the ultimate parent account formula. To create the report, you would need to choose accounts and create a summary report grouped by ultimate parent account field. 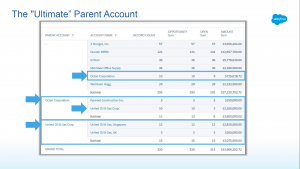 This report will help you to show how well your global accounts are performing by displaying the total opportunities for each child account under a parent account. By simply using the above reports, you can help your sales teams to track pipelines and monitor global accounts. I would like to thank Steve MO for sharing the deck and the report. Please fill the below form which would subscribe you to my blog and you would receive the link to download SteveMo presentation in your email. Feel free to post your comments and email me at buyan@eigenx.com for further questions.